Pictured are guns and ammunition found by law enforcement officials at a home on Nutmeg Drive Friday as part of search warrant. More than 50 weapons in all were found. Union County Sheriff’s Office Lt. Jeff Stiers said in his 24-year career, he’s never seen as many guns when serving a warrant. A Mill Valley man could face charges after local law enforcement agencies searched his home Friday and uncovered more than 50 firearms and a marijuana grow operation. 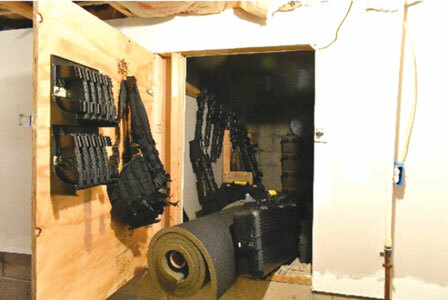 “In my 24 year career, I have not come across that many weapons in a home,” said Union County Sheriff’s Office Lieutenant Jeff Stiers. At about 9 a.m. Friday morning, detectives from the Multi-Agency Drug Enforcement (MADE) Task Force served a warrant to a home in the 1100 block of Nutmeg Drive. According to a release from the MADE Task Force, the raid was the result of a month-long investigation. Since charges haven’t been officially filed, the suspect’s name and address are being withheld. The investigation looked into the manufacturing and distribution of marijuana at the residence. According to Stiers, the investigation was the result of a tip. Inside, authorities found a “mixture” of guns totaling more than 50 weapons, as well as 14 marijuana plants. “A search of the residence conducted by the detective revealed most of the items being searched for,” states the release. Officials don’t yet know if any of the weapons are owned illegally. “We’re still going through them, so we’re not sure,” Stiers said. Authorities also took some cash from the home, but Stiers was unable to comment on the amount. The marijuana found in the home is being tested, and results may take up to 30 days. Once those results are in, authorities will forward charges to the Union County Prosecutor’s Office. According to the release, those charges will be illegal manufacturing of drugs/illegal cultivation of marijuana,trafficking in drugs and possession of drugs.